I have never been to Maine but after devouring THE POACHER’S SON over the weekend I feel as if I have spent a couple of weeks in the state’s back woods. With its first person narration and often viscerally confronting scenes it immerses the reader in its setting: a small, isolated community dominated by tough men, poverty and the natural beauty of the landscape (not necessarily in that order). Mike Bowditch is a rookie game warden (which for the uninitiated like me means he is a ‘real’ cop) whose life falls apart when his wastrel drunk of a father is accused of the murder of two men, one of them a policeman. Although Mike has almost no relationship with his father he believes him innocent and this sets him against his fellow law enforcement officers, including his own superiors. His own service is not directly involved in the investigation but everyone in local law circles gets involved when Jack Bowditch escapes custody, by handcuffing his captor to a tree, and goes on the run. While everyone is looking for his dad Mike starts looking for alternative suspects. It wasn’t the crime fiction plot of this one that kept me engaged (to be honest it’s a bit shallow and for the first two thirds of the book really doesn’t go too far beyond a few speculative accusations being flung about). However both the setting and the characters are very well drawn…way above the average offerings. Mike is in his mid-20’s and it shows: he’s impulsive and hasn’t quite found his feet as an adult yet. He’s broken up with his long-standing girlfriend, has an awkward (at best) relationship with his dad and precious few friends his own age. He is resistant to the way the world is changing; at one point someone calls him ‘the youngest old fart around’ or something similar and I thought this an interesting characteristic to depict. Although the whole story takes place in the present Mike shares plenty of memories of his childhood which provide readers with real insight into his relationship with his dad and the reasons for some of his own adult behaviour. I also couldn’t help but feel sorry for Mike in having to deal with the simmering animosity from his law enforcement colleagues, virtually all of whom were scornful of him purely because of his relationship to Jack Bowditch even before Mike professed any belief in his father’s innocence. I’m sure this is quite realistic but harsh nevertheless. The author’s love for the physical landscape is obvious (he is a registered guide for the state and editor of this magazine) and translated well to the page. This city girl had no difficulties imagining Mike in his largely solitary role traversing the remote areas of beautiful trees and lakes. A little less happily I also had no trouble picturing the various animal deaths described in the book, all on the violent side but not gratuitously so as they were definitely part of the natural story (though I haven’t eaten meat for days now). I can definitely see this book fitting well into the strong American tradition of a kind of rural crime fiction that celebrates its landscape while depicting misdeeds and worse (e.g. Nevada Barr, C.J. Box). 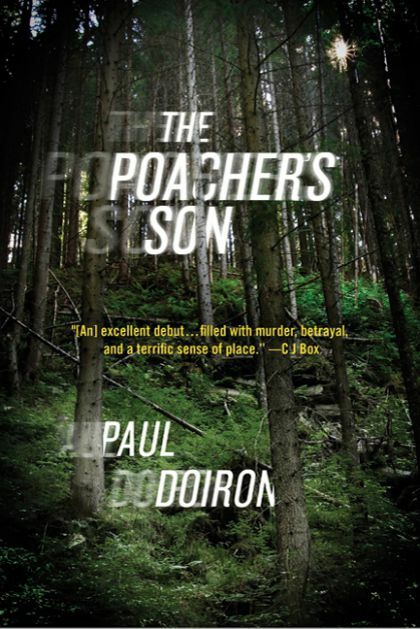 I liked the way THE POACHER’S SON was driven by a character not yet fully grown into himself and not only because this gives him room for future instalments but also because it is not something we see a lot of in crime fiction, at least not on this side of the law. I loved the book’s evocative setting. The plot, while definitely the less well developed element of the novel, had a stronger ending than beginning which is the opposite of most books and there was enough in it all to suggest this author is one who will improve. This read was yet another that came via one of the good recommendations with which I am blessed and in turn I recommend it highly to you all. This entry was posted in book review, Paul Doiron, USA. Bookmark the permalink. I’m so glad you liked this Bernadette. I liked the ending too which I felt was a bit different. I really want to go to Maine after reading this book. It’s on my list for holidays! Hmmm, I remember Sarah’s piece on this one also…….I’m still in two minds though. Maybe if I come across it, I’ll buy, but I probably won’t actively hunt it down. Pleased you enjoyed it though. Bernadette – I’m so glad you reviewed this one and even more glad that you liked it. I’ve been wondering whether I ought to read it and your review has convinced me again that I should. It sounds as though this is as much a story of a place and characters as it is the crime, which is fine with me when it’s all richly developed. I loved this especially in terms of location and the attention to naturalistic detail. Definitely a writer I would seek out again. Thanks for your good review, which adds more praise for this much-recommended book. I have been to Maine. It’s glorious. Whether one is inland and goes to Baxter State Park, visits small villages, drives along its Eastern Coast, dropping in on harbor towns or goes to the magnificent Mount Desert Island, it’s all lovely. I spent three summer vacations on Mount Desert Island. To sit at Beal’s Lobster Pier eating freshly-caught lobster, dripping with butter, while watching boats come in and go out of the harbor is something. It’s quite an experience to hike up Day Mountain, only to sit on top eating green apple pie freshly made by a local baker from Southwest Harbor, followed by reading a mystery. And to wake up and have you coffee and breakfast while sitting and looking out at a small harbor full of sailboats 15 feet from you is a unique experience. It was all good.